2015, ISBN 978-3-86205-047-5, iudicium Verlag, München, 289 p.
Corporate social responsibility (CSR) is a topical issue in many countries. What are the drivers for the global spread of explicit CSR- practices that are demonstrated to the outside- even in countries where companies had addressed CSR implicitly? What catalyzes organizations to adopt CSR and how does their adoption influence other companies’ likelihood to adopt CSR? This book approaches the recent world-wide adoption of CSR practices as part of the global spread of management concepts. The trend to adopt CSR is examined among Japanese companies, because they have rapidly adopted CSR practices in the last two decades. Existing empirical research on CSR in Japan that has focused mainly on anecdotal evidence on a small number of outstanding companies is extended by employing both qualitative and quantitative empirical research methods. 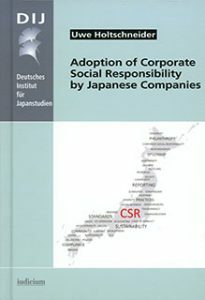 Analyzing drivers for the adoption of CSR practices, organizational characteristics of adopting companies, and how increasing adoption influences the likelihood to adopt provides insights into how Japanese institutions and stakeholders facilitated rapid CSR adoption and the process of CSR diffusion.